David got in touch with us back in November last year after being recommended from their celebrant, Natasha Hill – for their wedding out at Hillstone St Lucia, in the Rosewood Room which connects downstairs to the Library Bar room, for the dancing to begin when formalities upstairs are finished. David & Brittany both wanted the Dancing on the Clouds option for their first dance, and a mix of music for everyone to enjoy. I got there about 5:30/6:00pm to start setting up downstairs, and by 7:00pm I was ready to go. Guests made their way downstairs into the Library room, and huddled around the dance floor to watch them have their first dance – to their song Mark Wilkinson – First Dance. After the first dance – the Bridal Party made their way out and then it was straight into the dancing – with guests making their way onto the dance floor with their partners. We had a variety of songs played on the night – ranging from Coldplay, Pharrell Williams “Happy”, Justin Timberlake’s “Can’t Stop the Feeling” and Bruno Mars as well. One song in particular was Katy Perry – Roar which we had to play for Dave’s daughter along with “Shake it Off” as well – another favourite. 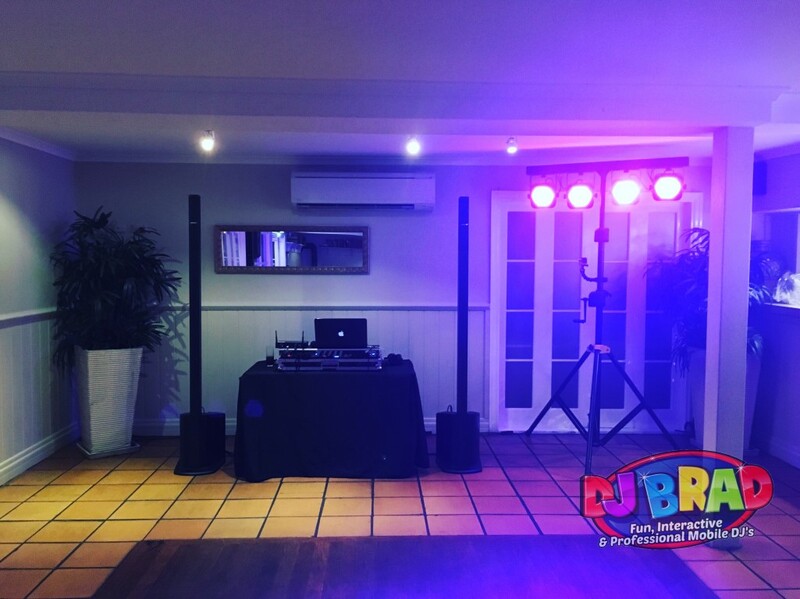 There was a wide variety of Pub Rock music which the guests really seemed to enjoy dancing to – huddling up around each other – jumping up and down singing and chanting – really made for an energetic night. Towards the end – we ended with a nice big farewell, full of cheers and excitement – along with guests lining up with hands in the air to send them off into the night together – finishing up the evening. Dave & Brittany came up afterwards and gave me a BIG thank you for helping me make their night a great success. It was great be part of it and share their special day.